Fresh from a highly acclaimed appearance as Orestes in the COC Iphigenie en Tauride, Canadian baritone Russell Braun joined forces with the Smithsonian Chamber Players for a deeply felt, superbly rendered concert of two Mahler masterpieces last evening at Koerner Hall. I recall *almost* hearing this same concert at Santa Fe several years ago with Russell Braun and the SCP forces, but alas it conflicted with an opera I was attending that evening. So I was very much looking forward to this concert at the beautiful and acoustically wonderful Koerner Hall. Imagine my surprise when most of the musicians playing with SCP was well known local artists, ie. Burashko, Quarrington, Dann et al. The mystery was solved when my colleague, RCM Publications Editor and Publicity Manager Barbora Krsek, told me only a small portion of the SCP musicians actually go on tour and it is the custom of SCP to pick up local musicians as guests in their concerts. Given it's two of Mahler's best known - and gloomiest - song cycles, the evening was a bit somber. Mahler composed Kindertotenlieder in 1904 and premiered in January 1905. Not long after, in a cruel twist of fate, Mahler's daughter Maria died of scarlet fever. There is something supremely sad about a life taken before its time, a thought fully expressed in Mahler's music. The chamber reduction, by conductor Kenneth Slowik, is even more austere than the original and I must say it takes away some of the orchestral colours one is used to. Braun's voice, with its warm, soft-grained timbre, and great dynamic control, is one of the most expressive in front of the public today. To be sure, there are lyric baritones out there with a richer, stronger, more solid core to the tone, or more volume, or with equally fine technical control. But to my ears, Braun's voice, which is a bit far back in its production, has that undefinable quality that seems to come from the heart. This quality is perfect for Mahler, particularly these two cycles. If I were to quibble, the placement of the soloists - and the instrumentalists for that matter - for both cycles are a bit too far upstage, as if there is an invisible barrier between them and the audience. As a result, the sound of both Braun and the tenor (Thomas Cooley) didn't stand out as much as they could. The second work, Das Lied von der Erde, is unquestionably Mahler's greatest song cycle. A symphonic poem of six very vocally demanding songs - the last one, Abschied lasting almost 25 minutes. This work could easily have been his ninth symphony, but Mahler chose to call it a symphony for tenor, alto and orchestra. It is usually presented with a tenor and a low mezzo or contralto, but here the alto's music was taken by a baritone. The six songs are set to Chinese poems loosely translated into German. Four of the six are based on poems by the famous Chinese poet Li Bai. The sixth song, Abschied, is a composite based on text by Wang Wei plus modifications by Mahler himself. Decidedly autumnal in nature, the text deals with the transience of life and the nature of loss. The three tenor songs are high lying and tends to be the more jovial pieces, while the alto pieces are sad and introspective. Cooley, a voice new to me, coped very well with the very high tessitura that has defeated many a singer. His is not a big voice and certainly not a heldentenor so often cast in this work, but it has a sweet and ingratiating quality that is appealing, especially in the quieter moments. To my ears, a lyric tenor is much preferable to a heldentenor who invariably sounds stentorian in this music. I find Cooley's timbre matches Braun's baritone beautifully. He also has the high register to do the music justice - should I say as much as is humanly possible given the treacherous tessitura and loud orchestration of the opening Das Trinklied. The centerpiece is the last song, Abschied or Farewell, one of the greatest in the song literature. Few who have suffered the pains of parting and loss can remain unmoved by this. Braun sang it with intensity, passion, and a powerful sense of resignation - a truly moving performance. Perhaps because of the economy or too many competing events - the COC's last performance of Rigoletto was also last evening - the hall was far from full. 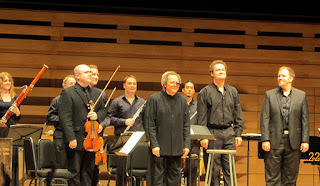 But the audience was very appreciative and gave the artists a well deserved ovation. If I were to make an observation - it appears that attendance at classical concerts are ominously down this year. Let's hope it's just a temporary phenomenon - our lives will be a great deal poorer without the arts.